Hello to all my Cushman friends. Jim Frederick, the owner of this web site, asked me to do an article on The Water Cooled Cushman Motor. No, this is not about the old water cooled stationary motors that Cushman made, it is about taking a Cushman M8 or M9 cast iron block and turning it into a water cooled racing motor. This motor will produce 25 Hp, and turn 7000 RPM. I know because I had a small engine dynometer that I tested motors on for several years while I was involved in building and racing the Cushman motor. 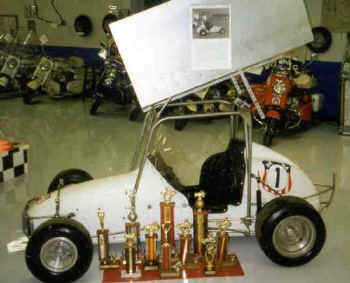 My Cushman powered Modified Midget is in Dennis Carpenters Museum in North Carolina and is pictured here. One thing that I learned the hard way in racing was that you keep your secrets to yourself, or you will soon have to run against them on the track. Since I am no longer racing the Cushman engine I am going to tell you some of them and a little about my racing career. For almost 20 years, the Cushman motor was the motor of choice in the National Modified Midget Association. When NNUVIA changed the rules and placed the 4 cycle 250cc motorcycle motors in their own A class and created the B class for industrial flat head motors to 23 cubic inches, the Cushman engine excelled as never before. A number of Wisconsin motors were competitive with the Cushman, but for every Wisconsin motor, there were 20 Cushman motors racing. 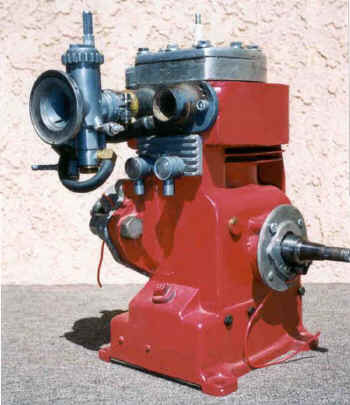 The Gladden Mustang motor was also used but suffered from a weak rod, as did the big displacement Briggs and Stratton. Cushman had so many good points in its design that it was a natural to build into a race motor. The placement of the intake and exhaust valve back from the cylinder bore, so that large valves can be used. Two roller bearings on the crankshaft instead of a ball bearing and a bushing like other motors. 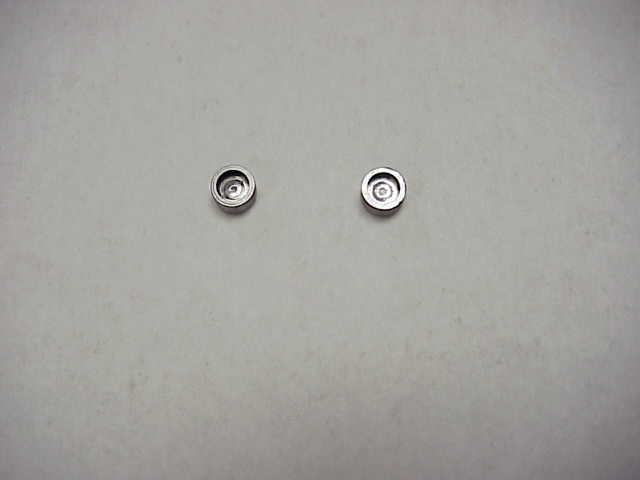 This is a strong point, but the placement of the bearings so far apart is a weak point. When I first started to race the Cushman motor I ran it just like the scooter motor, air-cooled. We had to use the Cushman industrial reverse cam in our motors because the motor was turned around with the carburetor and exhaust facing the rear of the racecar. The industrial cam does not change any characteristics of the engine other than allowing it to run reverse rotation. We turned the engines around because they were right behind our backs and the carburetor and exhaust would have taken up too much space behind the seat. Installing the motor in the usual direction would have required that we stretch the wheelbase of the midget racer past 60 inches. The longer the wheelbase the harder it is to corner on a small track so we did not want to do that. We also dropped the motor down in front of the rear axle to get its weight lower. The idea for the Water Cooled Cushman Motor was the brainchild of Bob Sawyer of Bartlesville, Ok. There may be others that built some of these about the same time as Bob, but Bob is the one that perfected the cam drive and the ignition point set up that we all used. A lot of time and effort went into preparing a water cooled motor, so when you had a good one you took good care of it, changed the oil after every race night, ran a good air cleaner, tore it down to replace the piston rings every third race night. When you wore the cylinder to .060 over you dropped a cylinder sleeve into the bore and started over. When we went to water-cooling there were also other changes to the motor. I will explain what worked the best for most of the Cushman powered midgets, and I am sure there will be others that have ideas that worked well for them. 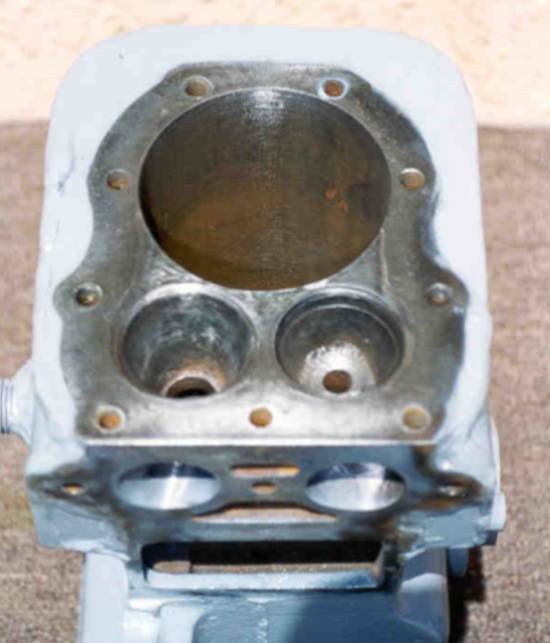 I first took the valve seats out and drove the valve guides down and out of the block Then using an air die grinder I reshaped the area under the valves to get good flow, keeping the area at the bottom unchanged. I ground the valve chamber larger as I angled upwards, right under where I would later grind the valve seats directly into the cast iron block itself.1 Strange as it may seem, the exhaust port of the Cushman is better shaped for an intake port than the intake port is.2 On many engines I filled in a good portion of the intake area around the valve guide with "Liquid Steel", the stuff you buy in tubes that they say will stick to anything. Notice in the picture how the intake valve guide sticks up in the path of the incoming charge. I pretty much duplicated the flow design of the exhaust port with this material. I found on the first motors that I did this to that the material came unstuck after a few races. I then used my Lincoln Arc welder with stainless steel rod to weld 10 or 12 little spots inside the valve chamber for the liquid steel to bond to and this solved problem. The idea here is that not only do you slope the intake passage with liquid steel, but also you maintain the same size through the intake passage to allow the venturi effect to move your fuel. Once you get up to the point just under the valves where the intake track is enlarged, you loose the venturi effect. You want to keep the same size intake tract as long as you can to move as much fuel as possible before you loose the velocity of the incoming charge. By filling in this area around the valve guide, you lower the cc’s of the area and keep it a more constant size. 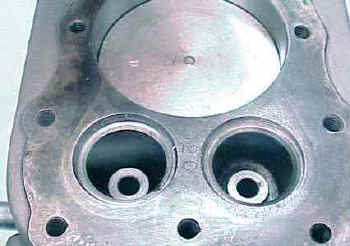 The next task is to relieve the area between the valves and the cylinder bore. Here is where many make the mistake of taking to much material out. You must take only enough to get good fuel flow. If you bolt a head gasket on the block you can mark the area with a felt marker where the out side edges of grinding the relief will stop. The picture shows how this is done. Remember that the more material you take out the lower your compression ratio will be. The full midgets running the old Ford 60 motor had porting and relieving down to a science and we were doing the same thing here except we were working with only one cylinder. You can see the relief work I did in the picture if you look carefully. Next I took the block to a good auto machine shop, and they ground the valve seat directly into the cast iron block using 30 degrees for the intake, and 45 degrees for the exhaust. Because of the high RPM that I would turn I chose valves with 11/ 32-inch stems, stronger than Cushman’s 5 /16 inch stems. I also used 80 pounds of valve spring pressure rather than only 35 pounds like a stock Cushman. The increased pressure assured that the valve followed the cam lobe profile closely and did not float. The intake valve was 1-5/8 inches in diameter and the exhaust was 1-1/2 inches. My next step in building the motor was to place it on my drill press and run a 7/16th end mill down through where the valve guides had been removed, and into the flat surface at the bottom of the valve chamber where the lifters stick up through it. 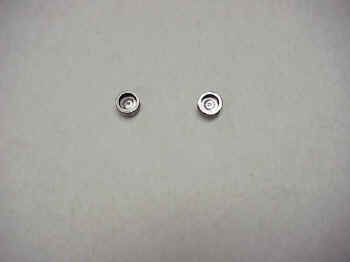 I only went to 1/8 inch deep here, just enough to make a recess to hold a Lash Cap.